Civil Engineering majors from the PUCMM Santiago campus, will soon have a new lab space, of 166m2, to carry out their practices at school. Grupo Therrestra made the groundbreaking to formally kick-off the construction of the new Materials Lab, which will serve as venue for Soil compaction, asphalt and concrete studies. Also, the lab will feature storage facilities for aggregates, sun-dried and cured materials. 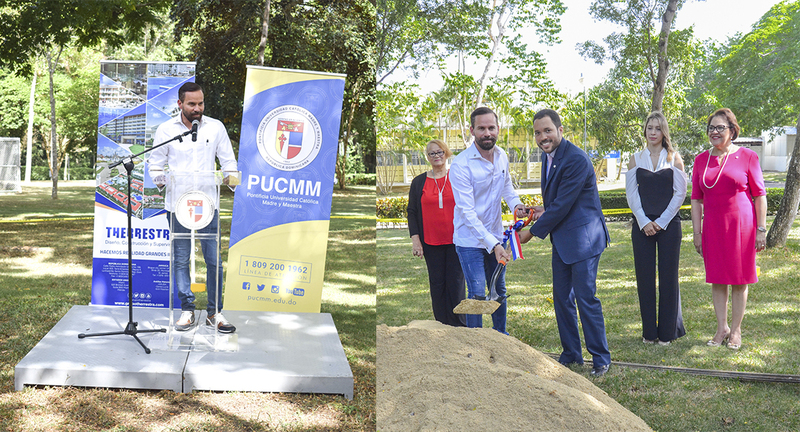 The Deputy Academic Chancellor, Daniel Suriel, stressed that the lab project is just one of the many partnership agreements underwritten between Therrestra and the university. “This agreement covers for all Civil Engineering and Architecture majors to participate in all tourist developments under execution by Therrestra. Also, the establishment of the Premio Therrestra a la Excelencia (*The Therrestra Excellence Award”) which will distinguish the academic performance of these students, by covering the tuition costs of their educational credits”.